While at a large outdoors show, I stopped by Tom Thomas booth. For those of you who arent familiar with him, he is the owner of The Outdoorsman and handles a lot of small caliber rifles including Cooper, Cascade, Kimber, and others. Dan Cooper happened to be there that day representing Cooper Arms. I had lengthy conversations with Dan and Tom about the small calibers. Toms wife handed me two small plastic bags with the stuff that I had bought. I didnt look at them very closely until leaving, but they were promotional cartridges from Bill Eichelberger. Bill Eichelberger is considered the industry expert for all of the sub .17 calibers. He has manuals for the .14 (I have this one) and for the .12. He has recently done some work with the .10 calibers and the two cartridges that I got were .10 caliber. Yes, thats right, I said .10 caliber. Why you might ask, does anybody need a .10 caliber. 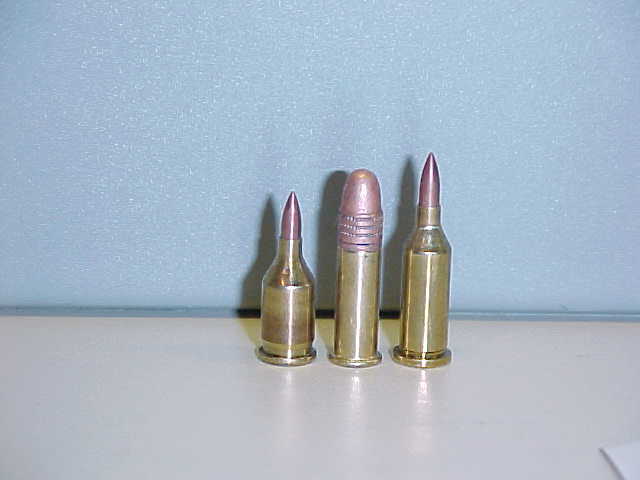 Below is a picture of the two cartridges with a .22 long rifle round in the middle for comparison sake. These wildcats are based on the CCM case and the .25ACP case and are called the Dart and the Pup. I dont have any performance information on these, just the cases. I am very glad to have received these cases and look forward to working with a .14 sometime soon. Think small.